Which way will it go? Cold and wet or warm and dry? Northwest winters can really vary, and so can their impact on your home and comfort. Our Plumbing and HVAC specialists would like to share tips that will be important whichever way the weather blows. First, let’s check in on the coming forecast! When we started the year, there was a warming in the waters of the Pacific Ocean called a “La Nina” event. The predictions at that time were for this coming winter to be cooler and wetter (snowier!). Things have changed out there. The La Nina is gone, so what should we expect now? NOAA is our National Weather Service (National Oceanic and Atmospheric Administration). Their forecast modeling is used around the world. Their current models show a slightly warmer than normal fall (as seen in the brown shading on the graphic to the left), followed by normal seasonal temperatures January through March 2017 (not shown). Our normal seasonal winter temperatures in Seattle are highs in the 40s and lows in the 30s, with the occasional day below freezing. Our precipitation, which everyone expected to be heavier than normal, will be average for the near term with a very wet spring. We set records for rain in Western Washington last spring and it looks like another wet one. On October 22nd, Fox Plumbing & Heating's Service Manager, Chad L was asked to come and speak on Kiro Radio. Chad spoke with Pete on Home Matters and discussed things that you need to do to prepare your home for winter. You can click the link below to listen to the radio broadcast and see what Fox prescribes to get your home ready for the winter. There are many things to do to prepare our homes for winter’s cold and rain. Here are three tips for your heating safety and comfort. Ready your home exterior. There’s nothing more frustrating than spending money to heat the air outside. To maximize your comfort indoors and save energy, check that your caulking, door weather stripping and sealing is tight. Clear gutters and outside drains of debris. Does that sound like too much of a project? It might be worth considering hiring a handyman to help. While you are at it, check hose bibs for leaks and cover them. If you find leaks, contact your local Fox plumber to fix or replace hose bibs and/or water lines. A leak now could be a messy and expensive burst pipe later. Prepare your equipment for a successful heating season. Gas equipment such as furnaces and tankless water heaters need tune ups to continue to burn clean and run efficiently. Schedule a furnace maintenance early to ensure any issues discovered can be repaired before it gets too cold. If you have an air source (outdoor) heat pump, be sure to remove leaves and debris from around the base. Test your ductless split system in heating mode to ensure it's in good working order, and clean the filter screens by brushing gently with a small paint brush or just rinsing in water. 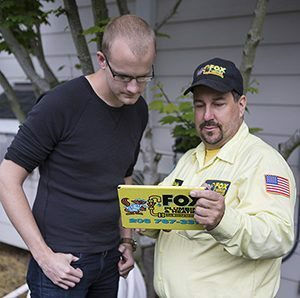 Keep in mind, Fox’s HVAC technicians are available 24/7 should you find yourself with a broken down furnace or heat pump, or are looking for an energy efficient upgrade. Breathe easier while indoors. This is also a great time to think about indoor air quality and consider options to reduce allergens, germs and smells during our “windows closed” season. We recommend that you have extra furnace filters on hand, and change them out every three months or as recommended by the furnace manufacturer. If you have an electronic air cleaner attached to your furnace instead of a paper filter, pull out and rinse the plate when needed. Most programmable thermostats can be set up to prompt you to remember to change filters. Be sure to have a working carbon monoxide (CO) monitor in your home and change its batteries if needed. According to the Seattle Fire Department, the US sees as many as 250 deaths each winter from CO leaks. They highly recommend having gas furnaces, stoves and water heaters checked by a licensed HVAC technician, and having a CO detector in your home. Ask your Fox HVAC technician about our other options to improve indoor air quality and safety during your maintenance appointment. Fox has Ultra Violet (UV) lamps and other products to provide greater air cleaning and can easily install these during your appointment. Fox Plumbing & Heating has our HVAC and plumbing trucks stocked and ready for winter 2016-2017. We are always happy to provide information about heating preparedness. For general information about winter preparedness, contact Take Winter By Storm, a local non-profit in our area. And you can follow this link to download your winter emergency checklist. Fox Plumbing & Heating’s professional journeyman plumbers and trained HVAC specialists are experts at sizing and installing tankless water heaters, mini-split ductless systems, and sewer repairs that fit your home needs. Contact us today for free estimates on any of the three above concerns. Fox Plumbing & Heating’s crew are here 24/7 for all of your plumbing, heating and cooling needs. Contact us for more information about any of your home service needs.